Michael Douglas fought back tears as he unveiled his star on the Hollywood Walk of Fame on Tuesday, with his father watching on. 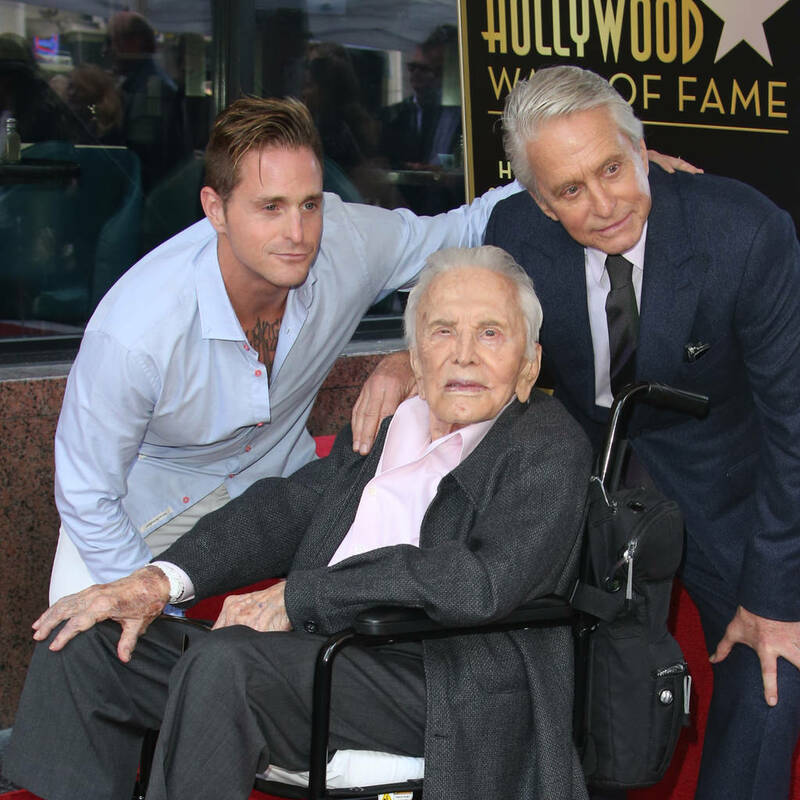 The 74 year old was honored with the 2,648th star near the corner of Hollywood Boulevard and Vine Street in Los Angeles, a few feet from his dad Kirk Douglas' plaque – and the 101-year-old movie legend was there to salute his son. "My dad is here," an emotional Michael said. "In a month, Kirk turns 102 years old. So those of you who took the under on him taking 80, you lost a long time ago. "It means so much to me, dad, that you're here today. I'll say it simply and with all my heart, 'I'm so proud to be your son'." Jane Fonda, Douglas' co-star in The China Syndrome, also showed up to honor Michael, stating, "When I first heard Michael was getting his star, I thought, 'What took so long…?' especially because he's been so ahead of his time. "Michael Douglas and I share something far more specific and unique than acting together… We both come from families referred to by the press as Hollywood royalty. Both of our fathers were movie legends, and thankfully, Kirk Douglas is still with us. Stepping into a family business, any family business, is always challenging. Look at the Trumps or the Corleones. "Carving out your own identity in a world-famous family business is especially difficult when parent and child are the same gender. I believe it was easier for me to follow in my father's footsteps than it was for Michael to follow in his father's footsteps… Michael has not only carved out his identity as a great, great actor with tremendous range, but as a great producer as well. He has rightfully been bestowed with all of the awards Hollywood has to offer… and now finally, a star on the Hollywood Walk of Fame." Michael was also joined at the ceremony by his wife Catherine Zeta Jones and son Cameron.